Luxor MB whiteboard series are made from magnetic reversible whiteboards. Chrome finish on main frame. 10 Year Warranty on Board. i3 Plus by Bestar has been created to adapt to your living space with the flexibility of its configuration possibilities. Its sleek design is Intelligent, Inspiring and Innovative. Durable commercial grade top surface with melamine finish that resists scratches, stains and wear. It offers two file drawers with letter/legal filing system. Drawers on ball-bearing slides for smooth and quiet operation. One lock secures both drawers. Meets or exceeds ANSI/BIFMA performance standards. Style your workspace with the executive styled LOF-418-O office chair from CorLiving. Easy to care for white leatherette with contoured lumbar support adds comfort and style to any office. Features include foam padded tilting backrest, foam padded seat, armrests and rolling wheels. Ergonomic gas lift adjusts the seat to your body height and shape with ease. This Monarch Specialties computer desk will be a stunning focal point in your contemporary home office. This stylish piece features thick panels and clear lines accented in a white finish. Its sturdy wood metal frame provides your work space with support and lasting durability. This desk can hold your notebooks, computer, and more with its organized, compact design. Sleek and contemporary, this computer desk in a chic white finish is the perfect combination of function, durability and design in a modern form. With clean lines, a floating top and silver track metal legs, this desk will add pizzazz to any home office. Featuring two storage drawers and a file drawer that can conveniently be assembled on the left or right side, making this unit uniquely yours to design. The large thick paneled surface provides plenty of room to meet your working needs without compromising style. 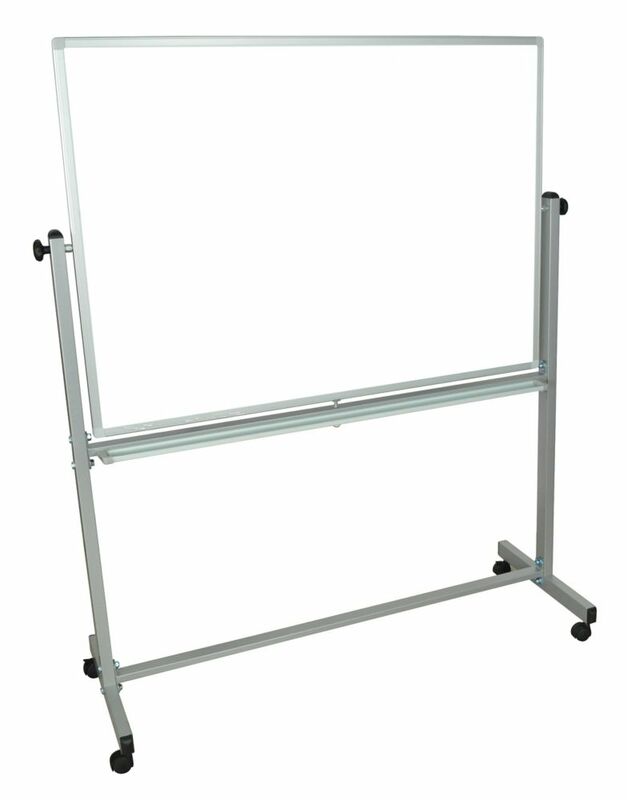 Double Sided Magnetic White Board 51x54x5 Luxor MB whiteboard series are made from magnetic reversible whiteboards. Chrome finish on main frame. Double Sided Magnetic White Board 51x54x5 is rated 5.0 out of 5 by 1.